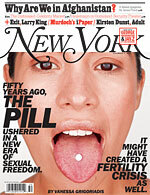 The latest issue of New York Magazine has a seven page story on the longterm fallout from the Pill’s legalization in the 1960s and it’s subsequent infiltration into mainstream American sexual culture. 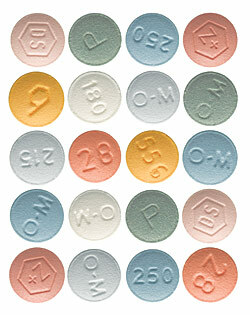 The magazine’s cover photo pictures a woman sticking out her tongue, a white pill stuck to it, evoking similar imagery from the Sixties of young people eagerly ingesting tabs of acid. The message is, of course, that the Pill is just as insidious as all the other drugs that came out of the era; it’s ‘free love’ revolution no better than the concomitant drug craze that left my generation moaning about their parents’ addictions and irresponsibility, feeling as if were left to clean up after somebody else’s party. The article makes the point again and again, that yes, contraception may have advanced female independence and sexual freedom, but it, too, has an irresponsible twin movement; it’s created a modern, multi-million dollar fertility industry fueled by women who delayed childbirth too long and now, in their thirties and forties, are miserable because they’ve failed to reproduce. The article succeeds in perpetuating beloved myths about womanhood, all which spring from one essential notion: women desperately want to have children and women who don’t are unhappy. Once you accept this basic tenet, a series of other beliefs follow as logically as a proof from highschool geometry. Women are naturally Madonna-like and possess the qualities we prize in good mothers; they’re dedicated, nurturing, and kind; their life’s mission is to find good fathers for their offspring; that’s why they seek out men who are powerful and rich and that’s why men are attracted to women who are young and fertile; and that’s why women aren’t motivated to be in positions of power and that’s basically why the world is the way that it is. Childless women are creepy, but they’re okay if they’re sad about their state. The way the New York Magazine article falls all over itself to highlight female pain reminds me of how the media paternalistically covers sexual assault survivors with gray dots so they don’t have to be ‘shamed’ again. Wouldn’t it be better if we had a society that actually recognized and valued those brave women for the heroes they are? Wouldn’t it be better if our culture actually valued childless women? There are also many women, perfectly happy, well-adjusted women, who don’t want kids. Elizabeth Gilbert, best-selling author of Eat, Pray, Love is one of them. She writes about her blissful childlessness in her book, Committed. Gilbert, successful and talented, is widely criticized for her self-absorption. But here’s a crazy idea: having kids is actually just about the most selfish act (read un-idealized-feminine) a human can engage in. Rapidly growing world population issues aside, we have children because we think it will make our own lives more fulfilling; we want to create another human being with someone we love; or we are seeking immortality by continuing our gene pools. That selfishness isn’t bad by the way. All ‘good’ deeds are self-centered. God was smart that way. We give money away because it feels good or work for causes or support political candidates because they further our personal beliefs. But as Erica Jong notes in her recent Wall Street Journal article, when women have kids, their worlds can become very small and limited, mothers turning away from the world’s unsolvable, overwhelming issues into the self absorption of their own families. The species needs to reproduce, we all know that. Having kids can be incredibly fulfilling, and it’s great that so many of us do it. But the under-reported story is not only the well-adjusted, happy women who live fulling lives that don’t involve children at all, but a culture, still desperately lacking in celebrating women’s other creative acts.